Nestled in the heart of Arizona, Gila County is a gateway to northeastern Arizona, providing access to I-40 and abundant recreational opportunities in the Mogollon Rim and the White Mountains. Payson is located midway between Phoenix (90 miles to the south) and Flagstaff (92 miles to the northwest), while Globe is convenient to both Phoenix (87 miles to the west) and Tuscon (108 miles to the south). Three interstate highways and six state routes pass through Gila County. In addition, Gila County owns or maintains a total of 765 miles of roadways (172 miles of paved roadways and 593 miles of unpaved roadways), of which approximately 500 miles are U.S. Forest Service roadways. Overall, the paved roadways are in very good condition. The majority of the traffic in Gila County travels on the US and state routes. US 60 is the primary east-west route connecting Phoenix and Globe. US 60 is a four-lane highway in the Miami-Globe area and a two-lane highway through most of the rest of Gila County. East of Globe, US 60 cuts diagonally across Gila County and traverses portions of the San Carlos Apache and White Mountain Apache Indian Reservations. US 70 is a two-lane highway connecting Globe to the San Carlos Apache Indian Reservation and the southeastern part of the state. SR 73 is a two-lane highway primarily serving the White Mountain Apache Indian Reservation. SR 77 is a two-lane north-south route connecting Globe and Winkelman. SR 87 is the primary north-south route connecting Phoenix and Payson. SR 87 is a four-lane highway between SR 260 in Payson and the Maricopa County border and a two-lane highway through most of the rest of Gila County. SR 188 is the primary route connecting Globe and Payson. The SR 188 cross-section varies from a two-lane highway to a four-lane highway. SR 260 is an east-west road that extends east from Payson to the Coconino County border. SR 260 is primarily a four-lane highway in Gila County that serves both local and regional traffic. SR 288 is a two-lane highway that heads north from SR 188 near Roosevelt Lake and ends at Young south of SR 260 where it connects to FS 512. SR 288 between mileposts 257.7 and 311.0 and FS 512 are designated the Desert to Tall Pines Scenic Road. Payson Airport is located one mile (2 km) west of Payson’s central business district. The airport covers 80 acres and has one 5,500-foot runway and one 50-foot helipad. It is mostly used for general aviation, and is host to a number of fire-fighting aircraft during the summer fire season. San Carlos Apache Airport is an airstrip with 6,500-foot runway, located seven miles east of Globe and publicly owned by the San Carlos Apache Tribe. Within 90 minutes from both Globe and Payson is Phoenix’s Sky Harbor Airport. With 3 terminals and 116 gates, Sky Harbor is the 11th-busiest airport in the United States, serving nearly 44 million passengers per year. Eight cargo airlines and 21 passenger airlines fly out of Sky Harbor. In 2006 the Arizona Eastern Railway, in cooperation with the Globe Main Street Program and the Apache Gold Casino Resort, commenced operating the Copper Spike excursion rail service between downtown Globe and the casino. Service was discontinued in 2011 after the railway came under the ownership of Genesee & Wyoming. Today, G&W ships agricultural products, chemicals and copper on the rail line originally chartered as the Gila Valley, Globe & Northern, extending 133 route-miles from Miami through Globe to Bowie (AZ) and Lordsburg (NM). Greyhound operates daily service connecting Globe to Phoenix and El Paso. Cobre Valley Community Transit serves Miami, Globe and the unincorporated areas of Gila County. 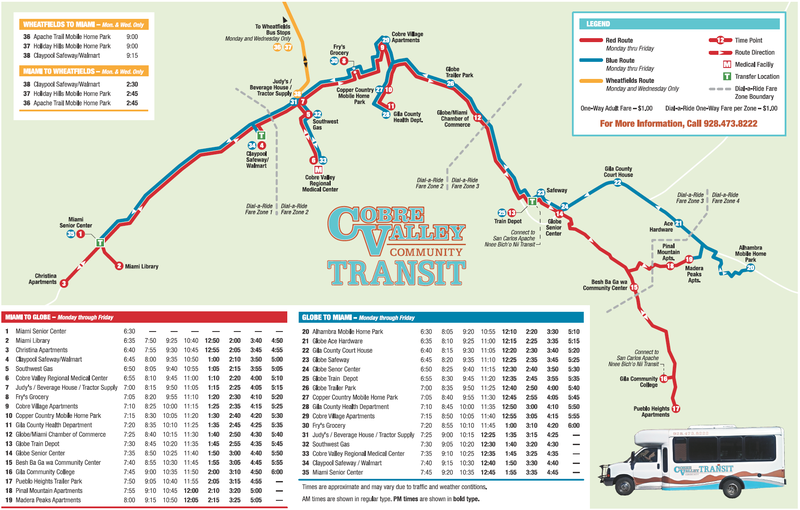 Click the thumbnail below to enlarge the Cobre Valley Community Transit Route Map. 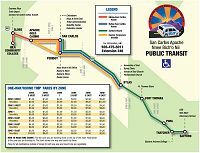 Operated by the San Carlos Transit Authority, San Carlos Nnee Bich’o Nii Transit connects San Carlos, the Apache Gold Casino, Fort Thomas, Safford, Bylas and Globe. 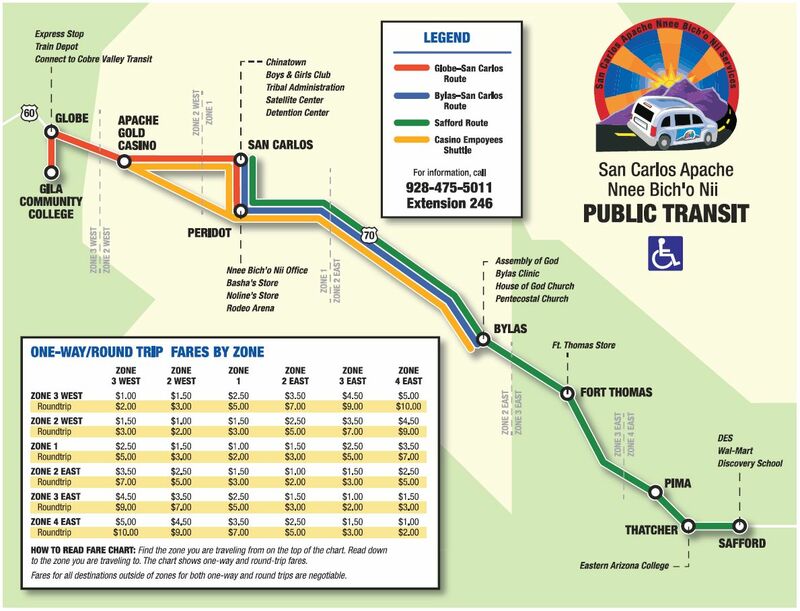 Click the thumbnail below to enlarge the San Carlos Nnee Bich’o Nii Transit Route Map.